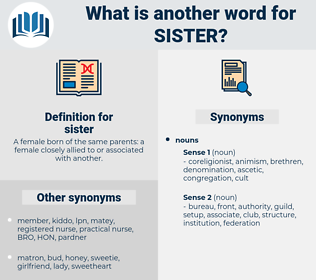 What is another word for sister? 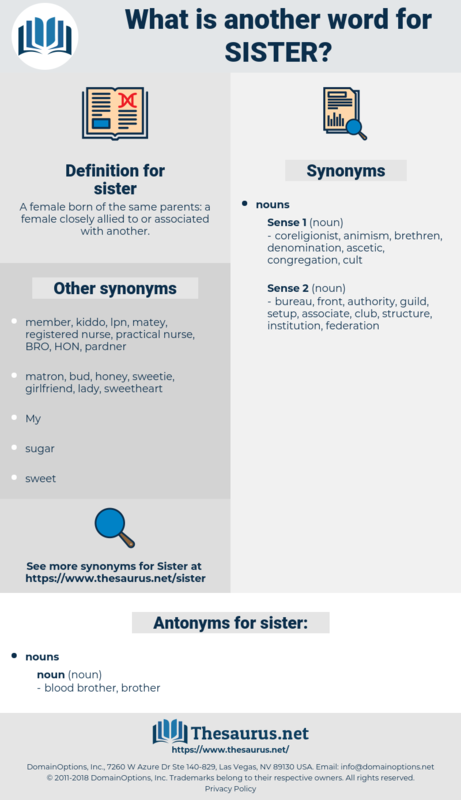 A female born of the same parents: a female closely allied to or associated with another. sibling, daughter, mate, twin, half-brother, girl. Yes, my sister has been talking about you - well we have, really. Of course you knew that my mother and sister were not at home? shadower, stature, suggester, stirrer, setaria, seawater, show the door, swatter, storey, starr, scooter, statutory, sequester, six-shooter, statuary, sou'easter, Sectary, stater, storeria, stray, shooter, satire, shoetree, six-day war, satyr, shot tower, setter, starry, suture, shuddery, souther, sweater, steatorrhea, scouter, suitor, satureia, six day war, steer, strew, stare, squatter, Sudatory, skid row, sou'wester, scoter, soda water, shoe store, stereo, sitter, store, side door, skitter, shad roe, shudder, skidder, seeder, shade tree, sudor, scatter, swither, succeeder, shatter, stir, sr, seder, stayer, stair, shedder, shudra, sutura, straw, starer, Skye Terrier, stutterer, sea star, sitar, sixty-three, stutter, sutra, star, set theory, story, sagittaria, skater, sector, sea scooter, sea aster, strayer, steerer, stairway, shouter, shutter, shyster, stator, stria, sudra, sea otter, Shittah Tree, satori.